I thought I would make a different thing this week and decided to do a little round up of books about cats that we like to read. 1) The Cat In the Hat: Defne loves Dr.Seuss books and this one is a favorite. 2)Poppy Cat is great for babies and toddlers with touchy feely pages to explore. 4)My Cat just sleeps: A little story about a cat who only sleeps and doesn't enjoy the things other cats do. 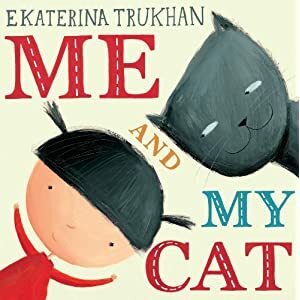 5)Me and My Cat by Ekaterina Trukhan. We borrowed this from the library last week. A heartwarming story about a little girl and her cat. 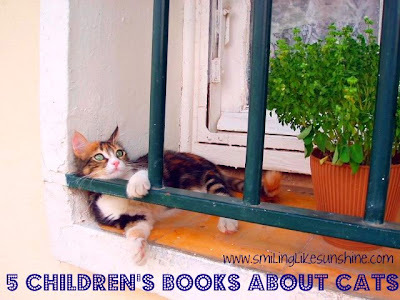 Do your children love cats and books about cats? We would love to hear your favorites,too. What have you been reading recently? Please link up and share with us. I love cats and books about cats! My kids don't have a lot of exposure, so we'll have to look for some of these! Great book to help kids deal with the loss of a pet, or just loss in general. I have given many adults copies of this book too. We love Kitten's First Full Moon by Henkes! My animal loving boys would love this. We have Ladybird Touchey Feely Kitten book for Babies and Young Toddlers which is a permentant fixture in our book box in the lounge. I can really recommend it. My son loves cats I'll have to check some of these out of our library. Aww, cats are so cute! Great list of books... I love the first photos! We just finished up a leaf unit study, so I gave one of the titles we enjoyed reading each day. What a great list of books!